Traditional apple crumble has to be one of the most delicious desserts ever to grace a table. Cheap and easy to make, the only problem you will face is that there won’t be any left over for a second meal. Tradition says that the classic Bramley cooking apple should be the one to use for an apple crumble, but any cooking – or dessert – apple will do. When apples are in season and plentiful, gather as many as you can, and if you have spare room in a garden shed or garage, select ‘keepers’ i.e. those with a thick, waxy, skin, and lay down on newspapers in layers and you will have a good supply of apples for the entire winter and into the Spring. Alternatively, if you have the freezer space, you can pre-cook and freeze apples very well, for use as needed. For a standard crumble to feed a family of 4, sift 175g (6oz) plain flour into a large bowl and add 75g (3oz) butter, cut into cubes. First of all, using a knife cut the butter into the flour until the butter pieces are too small to cut any further. Then using your hands, ‘rub’ the butter and flour mix between your thumb and the tips of your fingers until it resembles fine bread-crumbs. Be careful not to leave any lumps of butter in the flour. You can also do this in a food processor if time is tight. Finally, add 50g (2oz) of caster sugar and mix in. If you like a really thick crumble topping or are serving more people, just double the quantities. If you have any crumble mixture left over, it can also be frozen in a bag and used straight from the freezer next time. To prepare the apples, merely peel, remove the cores and chop into smallish pieces. Some people stew the apples lightly first, but there is no need necessarily and the apples will still cook perfectly well in chunks. 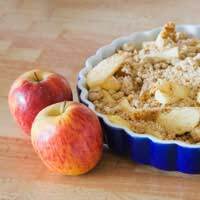 Put all the apple pieces in an oven-proof dish, and if a bit sour or sharp, add about 75g (3-4oz) of granulated sugar to sweeten. Then simply spoon the crumble mixture over the apples, pressing down lightly on the surface to seal any spaces. Bake in a pre-heated oven at 190°C/375F (Gas Mark 5) for about half an hour. When the top of the crumble starts to brown slightly, turn down the oven or place on a lower shelf and it will sit quite happily for another 15-20 minutes until you are ready to eat it. The traditional accompaniment to apple crumble would be to serve it with fresh cream – either single or double, but vanilla ice-cream, crème fraiche or custard all work equally well. Of course normally, crumble is served hot, but it is just as wonderful cold or eaten as a breakfast dish. Although apples are traditional, crumbles can be just as delicious and a bit more adventurous, if made with other types of fruit. Have fun experimenting or use the tried and tested fillings of rhubarb, gooseberries, blackberries, plums, damsons or a mixture of them all! You can also add flavourings to apple such as cinnamon, vanilla, nutmeg or ginger. Variations on the crumble topping can also be made, turning the humble crumble into a delicious dinner-party dessert. Try mixing a little muesli into the sugar and flour mix or add some ground hazelnuts or almonds with a few flaked almonds sprinkled on the top. Brown sugar can be substituted for white, which gives a richer texture - or Demerara can be mixed with a little ground ginger and raisins for a topping twist.